More than half a dozen incognito Apple representatives, including employees of known subsidiaries, visited AR waveguide suppliers at CES 2019, according to a person with knowledge of the meetings. Exhibitors at the expo included DigiLens, Lumus, Vuzix and WaveOptics, among others. Waveguides are commonly used in AR glasses as a means of routing graphical information from an output source to one or more display planes positioned in front of a user's eyes. Magic Leap, for example, utilizes the technology in a mixed reality headset launched last year. Scoping out potential AR parts suppliers has become something of a tradition for Apple, as the company reportedly participated in similar meetings at CES 2018. Apple did not immediately respond to AppleInsider's request for comment. Apple's interest in waveguides lines up with previous reports suggesting the company is investigating technology related to head-worn displays. Shortly after Magic Leap debuted its headset last year, it was discovered that Apple purchased AR headset lens maker Akonia Holographics. According to Akonia's website, which is no longer in service, the company's flagship HoloMirror product was able to reproduce full-color, wide field-of-view images with a single layer of media. Compared to waveguide technology, HoloMirror's design supposedly reduced system complexity, allowing for integration in smaller form factor devices like common eyeglasses. In 2017, Apple reportedly acquired Canadian AR startup Vrvana, which developed a hybrid headset called Totem. Marrying AR and VR into a single device, Totem utilized an array of cameras to enable 6DoF tracking and capture live views of the outside world for display on OLED panels located in front of a user's eyes. Apple is rumored to be working on a pair of so-called "Apple Glasses," an in-house designed AR headset that could debut in the next few years. Previous reports have claimed the project, referred to internally as "T288," runs its own "rOS" operating system and employs ultra high-resolution 8K displays and a separate processing unit to overlay virtual images over real-world objects present in a user's field of vision. Whether Apple intends to rely on HoloMirror, waveguide, mixed reality or another, unknown technology for its headset remains unclear. 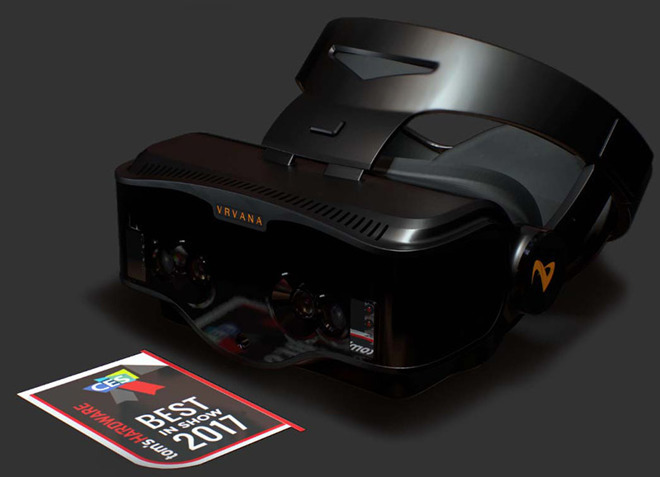 A burgeoning sector of the wider consumer electronics field, AR has become somewhat of a buzzword as top-tier industry players begin to show interest in producing their own solutions. Cellular providers are also getting in on the act, highlighting data-hungry devices like AR headsets as prime candidates for 5G integration. LG UPlus, a wireless subsidiary of Korean tech giant LG, was on hand at CES 2019 to take a closer look at AR products like the Vuzix Blade smart glasses, reports ZDNet Korea. The company is seeking out novel AR and VR devices as it aims to differentiate 5G communications amidst a network buildout this year, according to CEO and vice chairman Ha Hyun Hwoi.